Apple added more than 30 e-mail stationery templates as part of Leopard, covering most major occasions and organized by category. These Mac stationery templates include birthday parties, baby announcements, and thank-you notes. To see your choices of stationery for your e-mail, click the Show Stationery button at the upper-right corner of the compose window to check out the possibilities. Clicking one gives you a preview of what your message will look like. Although many stationery templates include pictures, Apple doesn’t expect you to use them in your mailings. These pictures serve as merely premade drop zones for adding your own pictures. Click the Photo Browser button at the upper-right corner of the New Message window and drag a picture from iPhoto, Aperture, or some other location into the picture placeholder on the template. Double-clicking this new photo lets you pan and zoom the image, letting you place the image just so. You also don’t need to accept Apple’s wording in any of these templates either. Just single-click the area with text, and make the substitution. If you find a stationery pattern you really like, drag it into the Favorites area to build up a custom collection. Because Mail templates conform to HTML (the language of the Web), the people receiving your e-mail will be able to view the stationery you intended. It doesn’t matter if they’re on a PC or Mac. 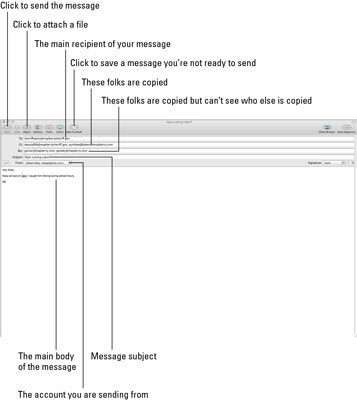 Mail also lets you use your own custom designs as templates.